Denver enters its snowiest month of the year with well below average snowfall this season. Through February, Denver International Airport (where official records are kept) has recorded 25.7 inches of snow, nearly 10 inches below normal through March 1st. On average, Denver sees 11.5 inches of snow in a typical March. This year, the city will need to see 21 inches of snow by March 31st to get us back to the seasonal average, not unheard of, but a steep climb. In March of 2013 Denver recorded 23.5 inches of snow, the year prior just a trace. The month certainly started out with a wintry bang Saturday. Bands of heavy snow pushed across the Front Range and urban corridor Saturday morning bringing pockets of heavy snow through about midday. Tragically, light freezing rain preceded a sudden burst of heavy snow that moved across Denver late morning leading to a 104 car pileup on I-25, resulting in over 30 people being hospitalized and one death. The snow diminished rapidly across the metro area Saturday afternoon. Downtown Denver received about 1 to 2 inches of snow, right in range from our forecast Friday, and a few locations north and northwest of Denver did slightly better with 2 to 4 inches in a few locales. Quite a hit-or-miss snow though with lots of locations without a single flake. Along with the wintry mix has been bitter cold. Saturday morning lows across the region were in the single digits with light snow flurries. It will remain chilly for most locations through Sunday before we kick of the week with much warmer temperatures Monday. We will be tracking to disturbances for the next week. The first due in during the Tuesday/Wednesday timeframe at this moment looks rather benign for the eastern plains of Colorado, but will leave a mention of rain and snow showers in the forecast for Tuesday night into Wednesday. Thursday is set to be the pick day in an already warm week with temperatures forecast in the upper 60s, although windier, for Denver ahead of the next couple of systems due in late Thursday and Friday. This one-two punch looks to have the best potential to bring rain and snow to Denver over the next 7 days, though model consistency has been a complete mess over the last few days in handling it. However Friday's storm pans out, it doesn't make a whole lot of sense to upsell it too much today given how this winter has gone. For now will introduce a chance for rain and snow, but will refrain from getting too excited about it given low confidence and high probability it'll be nothing rather than something. 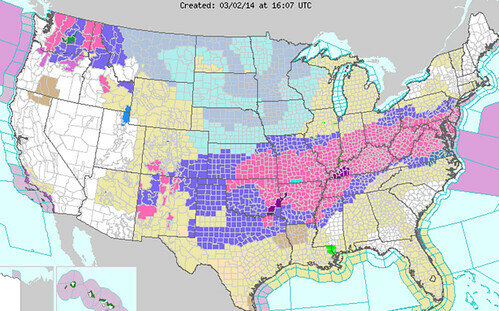 The system that brought us snow Saturday has unsurprisingly turned into a mega-storm out east. Winter storm warnings are posted from southwest Colorado this morning through New York as this latest storm gets set to bring another round of heavy snow to someone in the mid-Atlantic. As far as patterns go, this one has been unrelenting. Luckily this latest system has it's southern origins way back in the Pacific, and finally brought some substantial rain to southern California. From the plains east, it looks entirely like the rest of the winter. Bitter cold temperatures are again slamming the upper midwest where wind chill warnings and advisories are out for parts of 10 states, and heavy snow and ice will make for a tough start to the week for millions in the east.